I am amazed at how some of the easiest tips and tricks help people to catch more fish. Before you skip to the video, perhaps you might pay attention to a few other details along the way in this blog article. This simple trick is a move that I have been doing for years that is so stupid simple anyone can do it! Yes, even you new guy that keeps snapping off flies and snagging his hat. First, let me start by saying that to catch more trout on Hoppers you should start by becoming a better caster. Plain and simple. Let's not overlook the obvious before we get "techy" here. Everyone hates a nerd that knows everything about fly fishing but can't throw a decent cast. In addition to strengthening your cast, there are some things that can swing the bite in your favor and one of these is to "strip it off the grass". MOST ANGLERS don't do this. They just don't and after I show you some will go "ooooohhhhhh". Others will go "of course man, I always do that". Fact is, I rarely see this done yet it is so easy. The truth is you are going to hit the grass sometimes. I'll start by correcting the idiot who said... "if you aren't losing a lot of flies you aren't fishing!". No, if you ARE losing a lot of flies you aren't fishing... at least half the day because your guide is busy tying more on and scrounging around his kit bag looking for some expendables! I think that saying originated at another fly shop. 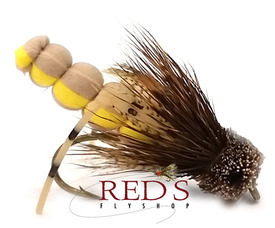 At Red's we know you are totally capable of losing enough flies and therefore buying enough flies to keep us in business. Don't lose more than you have to. Ok, back to the message. So you hit the grass, what do you do next? When you hit the grass with your hopper, don't reflex and snap back like a cast, spazz out, break it off, or do all the other crazy stuff that most anglers do in a panic. Stay calm, put your rod tip down slightly under water within a second or two of hitting the bank and either strip with your line hand or let the river's current pull your fly not just OFF the grass, but down into the water right next to the grass. When this is performed correctly its a thing of beauty. You'll find more fish, bigger fish, lose less flies (because your fly goes DOWN not into the next chunk of grass or the tree overhead), and cover water smoother and more efficiently than before. Sometimes, especially from a boat, there might be a slight belly in the line, but if the big hungry trout sees your bug "walk" of the grass he won't let it get far! The drift will usually last long enough to score some points. Most fisherman tug back with the rod high and when they fly does come out it is 2 feet or more from the bank. In this part of the world right now 2' from the shore is a joke! That is if there is flow under the cutbank anyway. The trout are sucked waaaaayyyy up under right now. Thanks for the helpful tip on getting it close to the bank! Where can I buy the snazzy 509 hat?